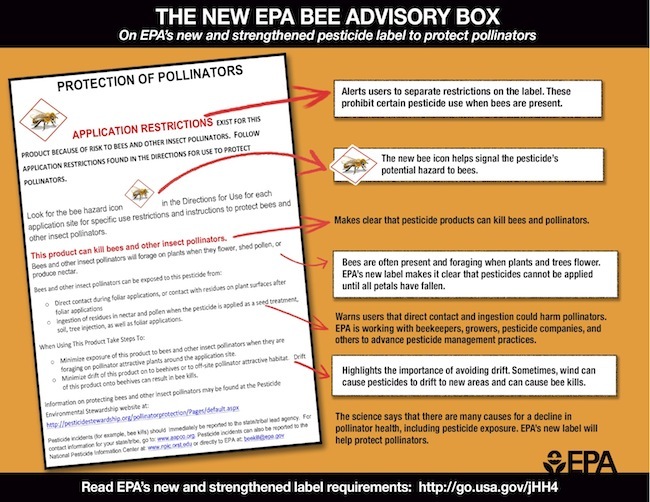 The Environmental Protection Agency (EPA) has developed new bee advisory labels to inform applicators about some pesticides’ risks to honeybees. If the EPA’s schedule goes as planned, pesticide applicators will begin seeing the new label language in 2014 on neonicotinoid insecticides, including imidacloprid, dinotefuran, clothianidin and thiamethoxam. The new labels will have a bee advisory box and icon with information on routes of exposure and spray drift precautions. The EPA said it will work with pesticide manufacturers to change labels so that they will meet the Federal Insecticide, Fungicide, and Rodenticide Act (FIFRA) safety standard. Earlier this year, the European Union restricted the use of three types of neonicotinoid pesticides. In June, Oregon issued a 180-day ban on the use of dinotefuran after a bee kill-off in a shopping center parking lot. In May, the U.S. Department of Agriculture and EPA released a report on honey bee health, showing scientific consensus that there are a complex set of stressors associated with honey bee declines, including loss of habitat, parasites and disease, genetics, poor nutrition and pesticide exposure. 1 Comment on "Coming soon: pollinator protection labels"